The PMV P-1700 series is specially designed for use in corrosive or high temperature environments with all external parts made from stainless steel. Internal parts are made from stainless steel on models P-1700 and 1720, and from aluminum on models P-1710 and P-1730. The models P-1720 and P-1730 are high air delivery models. The P-1700 series is designed for double acting applications but can easily be used for single acting applications by plugging one port. 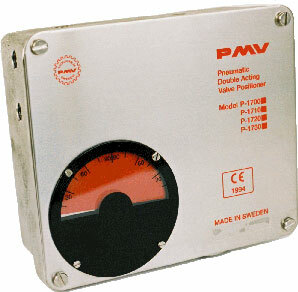 A PMV I/P converter in a stainless steel field housing which easily mounts on top of P-1700 series is available. Simple and easy to calibrate. Can reverse rotation simply and quickly.